How many times do we hear this all-to-popular phrase: “Hate the sin, love the sinner” when someone is trying to shut down our rebuke of worldliness or wickedness? While sometimes the phrase is spewed at us with a matter-of-fact attitude from an Atheist who thinks they have us pinned by the so called bible quote, often times it is also used by a worldly unlearned “Christian” who also wants to silence any rebuke we had to offer. However the truth about the quote “Hate the sin, love the sinner” is that it is not even from the bible at all! It is actually a quote from Mahatma Gandhi, a man who rejected Jesus Christ! 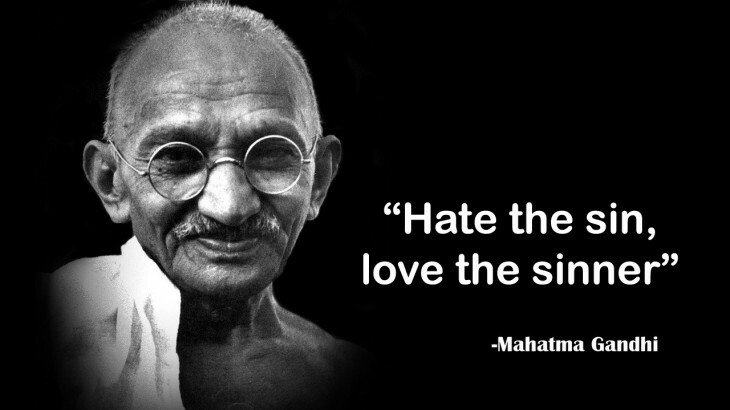 And even after you get through to the person that they are quoting Gandhi rather than the Bible, they will continue with the assumption “God does not hate” and then continue on with the “Preach love, not hate” mantra. Basically these people try to make the attribute of “hate” forbidden by a Christian. However this can not be further from the truth. Alike the attribute of being angry, the attribute of hate is also acceptable when it is for just cause. First of all. Does God hate? And does God hate the person rather than just the “sin” a person commits? Right there are just a few of many examples of God not only hating the sin but God hating the person! Now, does a man of God ever hate a person? There are several more examples but this one is perhaps one of the most clear examples of a man of God actually hating people, not just their sin. 20 For they speak against thee wickedly, and thine enemies take thy name in vain. 21 Do not I hate them, O Lord, that hate thee? and am not I grieved with those that rise up against thee? 24 And see if there be any wicked way in me, and lead me in the way everlasting. Ok. So by now there should be no doubt that both God and a man of God can not just hate the sin, but hate the sinner as well. However oftentimes the next step by the angry Atheist or the pussyfooted Christian will be to misquote the bible by spewing one of the verses about hating your brother such as “Whosoever hateth his brother is a murderer: and ye know that no murderer hath eternal life abiding in him.” (1 John 3:15 KJV). here is the thing. That use of the word “Brother” is in reference to a spiritual brother. That being, a fellow believer. Therefore that is a gross misuse of scripture to apply it whenever we hate workers of iniquity. And there is the bottom line. There is a difference between our own enemy and an enemy of God.Jesus told us to love OUR enemy. And that is what we are doing when we are giving them the truth. To know someone is heading to hell and doing wrong against God and to NOT say anything is to actually HATE THEM! Who cares about their feelings so they can be comfortable in their sins against God! Telling them the truth is to love them! And loving our neighbor is most certainly to give them the truth as well. Our own enemies are not necessarily God’s enemies. Our enemies can be people who compete with us at work or just don’t like us for some reason. However a God hater who works iniquity is an ENEMY OF GOD. And as you saw in Psalm 139 KJV, God’s enemies are our enemies. dyke, fag, God, hate, hater, homo, Homosexual, Jesus, King James Bible, KJV, sin. permalink. Amen brother – great article! I get so sick of hearing people parrot this lie. I would expect atheists and unbelievers to do it (even though it is illogical for them to do so) but those people who call themselves Christians should surely know better! AMEN!!!! This article is spot on!!!!! thanks for the article. itsinteresting andi am curiousso will ask you do you have thoughts on forgiveness and how that is linked with hating sinners? do we hate sinners or does God hate sinners until they repent and then He /we starts to love them?